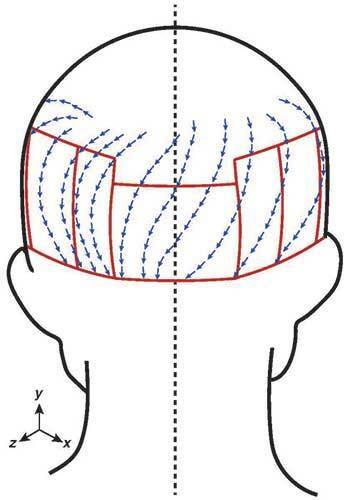 As hair grows on the back of your head, it changes direction and the caliber becomes gradually finer at the lower areas. When you take a strip (FUT), even a narrow scar on a shaved head reveals an abrupt change in hair direction and hair caliber. Related to the donor area, with FUE this doesn’t happen, but there is a chance of white dotting. If dotting occurs, it nearly always isn’t visible until the hair is cut very short or the head is shaved. White dotting or hypopigmentation can be improved greatly through a combination of tricopigmentation and FUE into the dots. This is usually never necessary unless a patient decides to go with the shaved head look. 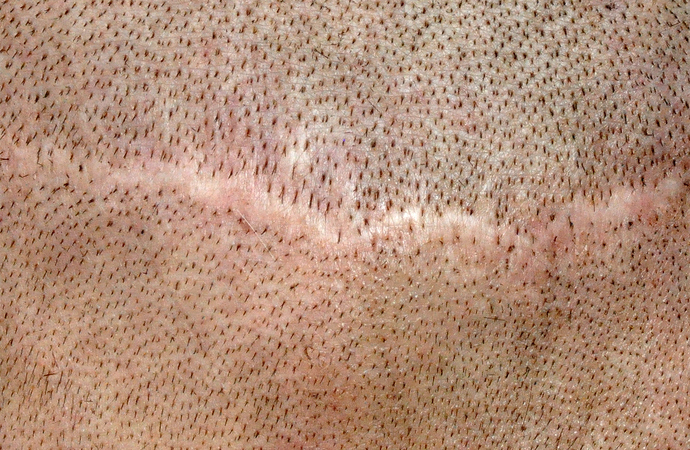 Dr. Cole often sees several patients per week who come in for strip scar repair. Our patient today wants to be able to wear his hair relatively short. Before his donor/repair area was prepped for surgery, our patient’s hair was approximately 10mm in length. Even at that length, his scar was very visible through his hair. When you examine the areas above and below his strip scar, notice the difference in hair caliber. There are also subtle differences in the direction of hair growth. With FUE on the other hand, some patients are more susceptible to white dotting (hypopigmentation) than other patients. Treating the donor areas with ACell at the time of surgery helps to reduce the white dotting. Except in the most extreme cases, these small circular FUE scars are not visible when the hair is cut short. Tricopigmentation, a more temporary version of scalp micropigmentation helps restore color to the hypopigmented dots. Tricopigmentation is very useful in treating strip scars as well. Our strip scar patient today will first receive beard hair into the scar. He will return at a later date for either more grafts and/or tricopigmentation. 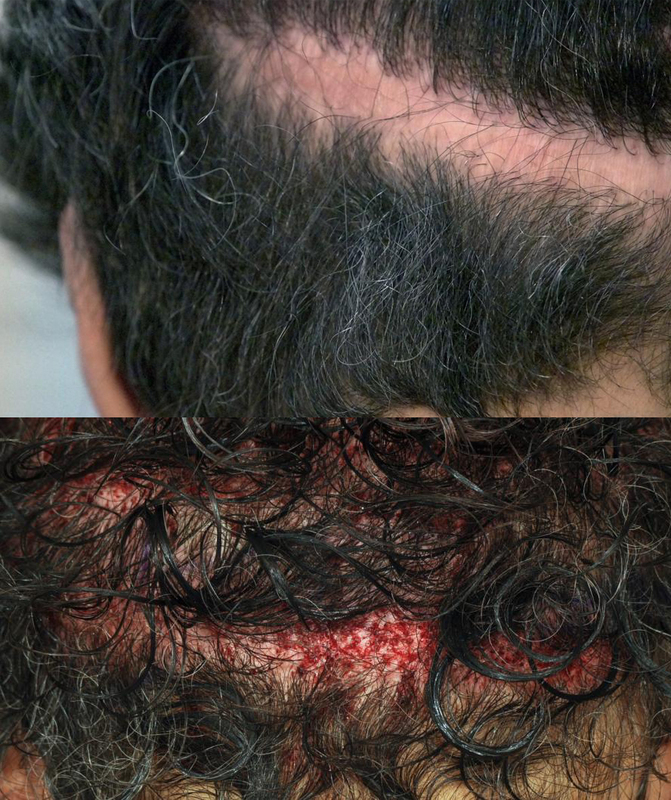 Both photos below represent our patients scar before any treatment. Abrupt changes in hair direction and natural hair caliber gradation are irreparable. Larger strip procedures can make these post-strip changes more pronounced. The good news is, the scar itself can be greatly improved. My scar is probably similar to this one you have in the picture. Approx how many beard grafts would be necessary to fix this without scalp pigmentation? Just asked Dr. Cole how many beard grafts he would recommend for this scar. He said it varies from patient to patient, but approximately 250-300. Dr. Cole also commented about ACell which often improves yield. Growth does vary however. Sometimes we see 100% and sometimes 60% but beard is far more reliable than chest hair when alternatives to scalp hair are used. That sounds good, 250-300 grafts sound like a small price to pay to fix this problem, can you also find out if Dr. Cole can fix this without shaving the back of my head where the strip scar is? I want as little downtime as possible and be able to go right back to work without anyone noticing. Dr. Cole offers a non-shaven repair procedure. Here is a photo of a patient who had a much more severe scar that required 800 grafts. The lower photo was taken immediately after surgery. 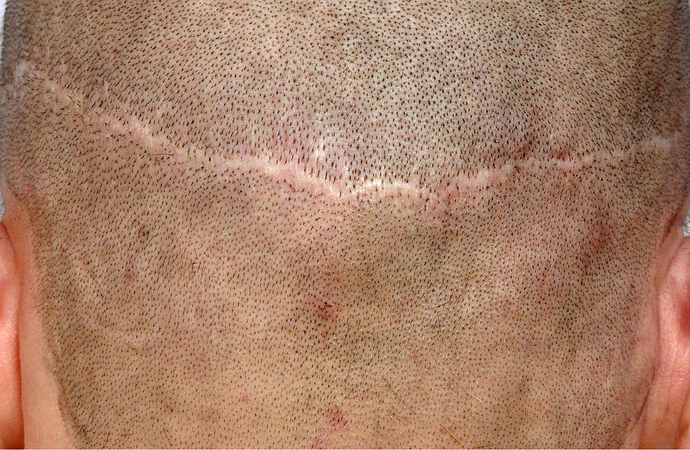 His hair is wet and combed in this post-op photo for our records, to reveal the scar repair area rather than conceal it. Reasonably long hair and a normal range of hair density in the back is able to conceal a strip scar repair area most of the time.